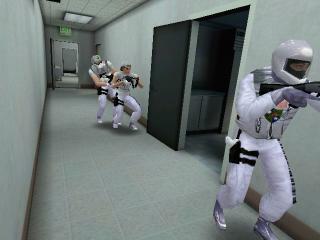 In prior installments, we have referred to techniques by other players and by real life SWAT teams involving the use of the element to clear a building. In many of these scenarios, there are specific roles to be played by different members of the team, such as: breacher, rearguard, etc. Many serious co-op players, when playing a slow and deliberate game, will use the Red team to breach and gas etc, while Blue covers Red or covers the rear. That is fine but here is another formation which reflects actual tactics used in the real world. Why would you do this? Well, it allows the Blue team to cover the Red team without trying to shoot over their shoulders and risking a friendly fire incident. When clearing a hallway, the element would proceed in this order to a doorway. Blue One would pass the doorway and continue facing forward, with his back to the door. He would proceed far enough down the hallway to avoid getting shot in the back when the door opens, but would not pass any other openings, if possible. Red could then go about their normal task of opening, mirroring, gassing and so on. Meanwhile, Blue One is covering their front and Blue Two is covering their rear without any trouble. The EL is safely between the two sets of cover, directing the activity. This is a real tactic that is taught by DOE instructors to SWAT personnel.